Protect Your Pet's Dental Health, All-Day, Everyday! 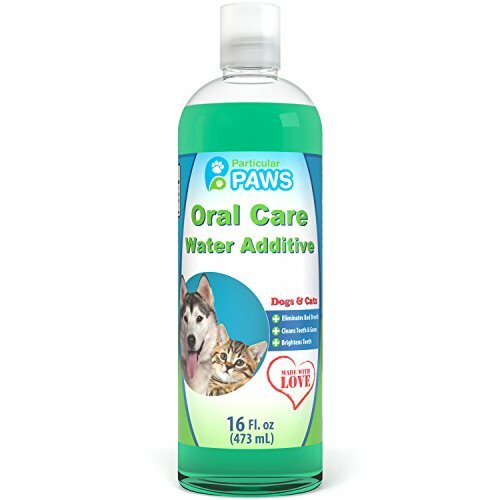 Particular Paws Dog & Cat Oral Care Water Additive is an Easy, Effective Addition to Your At-Home Dental Plan. Our unique oral care formula fights plaque and tartar, eliminates bad breath, strengthens teeth, plus heals gum tissue at a cellular level. Using the formula is very easy. Simply add two to three capfuls of additive to every 16 ounces of water in your pet's water bowl each time you refill. As your pets drink their additive infused water throughout the day, they'll also be improving their dental health! Each sip means less bacteria in the mouth, less tartar and plaque buildup, plus a minty fresh breath you will love! Dogs and cats, generally, don't like having their teeth brushed. Although an at-home brushing program is an important part of your pet's general health, the entire process can be unpleasant for both you and your pet. Cut your pet's brushing needs in half with Particular Paws Oral Care Water Additive! Regular use prevents food and tartar from sticking to your pet's teeth, keeping the mouth clean, therefore reducing the amount of brushing required. We worked with our specialized veterinary experts to locate natural bacteria fighting, oral health promoting ingredients right from nature. So, unlike other dental products that are toxic if ingested, our Fresh Breath Water Additive contains no toxins or harsh ingredients. Order today with no risk! If you and your dog don't love this unique formula, you can return the product for a full refund. Our main priority is the complete satisfaction of both you and your dog! Particular Paws Oral Care Water Additive is the Easy Solution for Fresh Breath, Healthy Gums and Clean Teeth - Order Today with No Risk! PROMOTES DENTAL HYGIENE: Particular Paws Oral Care water additive is a simple and effective product you can add to your pet's oral care plan. The mouth is full of bacteria that causes bad breath, tarter, and plaque build-up that deteriorates the teeth. Our Fresh Breath Water Additive kills the bacteria inside your pet's mouth, preventing tooth decay, gingivitis, tooth loss, and abscesses. Plus, less oral bacteria means your at-home dental hygiene routine will be a cinch! GREAT TASTE PETS LOVE: Our dental water additive contains a unique blend of ingredients infused with a light peppermint and spearmint flavor that pets can't get enough of. You'll love how our fresh breath additive lasts the whole day, destroying the bacteria that's causing bad breath. No more doggie breath or fishy feline odors, just a simple aroma of minty freshness. IMPROVES GUM HEALTH: Your pet's gum line traps food particles that attracts tooth decaying bacteria every time he eats. Help your pet keep bacteria off the gum line by using our dental care water additive in conjunction with an at-home dental program. Improves healing time after a dental extraction, decreases infection and lowers the risk for bacteria entering the blood stream. Use Oral Care Water Additive after each meal to keep your pet's oral hygiene at its best. POWERFUL, GENTLE FORMULA: Our team of veterinary dental experts have developed a unique oral care solution that you won't find anywhere else. Formulated with all-natural ingredients. No toxic or chemical additives whatsoever! 100% SATISFACTION GUARANTEED: Try the oral care formula today with no risk! All Particular Paws products are backed by a no-hassle refund policy. If you have any questions about this product by Particular Paws, contact us by completing and submitting the form below. If you are looking for a specif part number, please include it with your message.